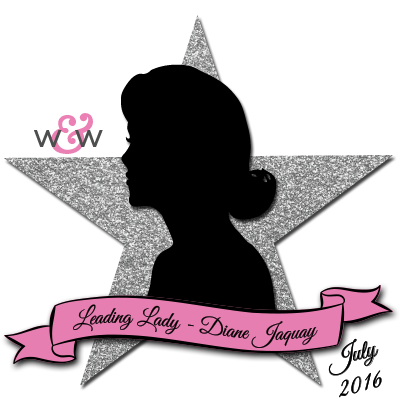 July is coming to a close which sadly means it is our last Saturday with our radiant July Leading Lady, Diane Jaquay. I feel so honored and blessed Diane has been our Leading Lady this month gracing us with her stunning skill, vast versatility and clever creativity! I am sure I am not alone in feeling fortunate to learn more about such a lovely and gifted lady. What a joyful and joy-filled July it has been! If you missed learning more about Diane...CLICK HERE or her smashing debut you must see it...CLICK HERE or her sensational second performance taking on a single cutaway (die) set CLICK HERE or her cutting-edge triumphant third performance CLICK HERE! Hello! I can't believe today is my final performance, the month has really flown by! Today I'm going to be sharing some ideas for adding color to your cards without having to color your stamped images using traditional methods such as markers, pencils, or paintbrushes. Something that you might not know about me is that my hands shake, badly! My doctor diagnosed my condition as familial tremor, and I've had it my whole life. My grandmother had it, and my brother has it too, so it seems to be something that runs in families. It's a huge challenge for me to color stamped images with Copics and watercolor brushes. I can do it, and I do do it, but it's a very sloooow, painstaking process, and sometimes I don't have the time to devote to it. So I tend to try and find other methods of adding color to my cards, because I do LOVE color! So let me show you a few methods that work for me, and I hope will help others who have difficulty coloring. Obviously solid stamps are a good choice for me, but sometimes you want more than just a plain, solid stamped image. 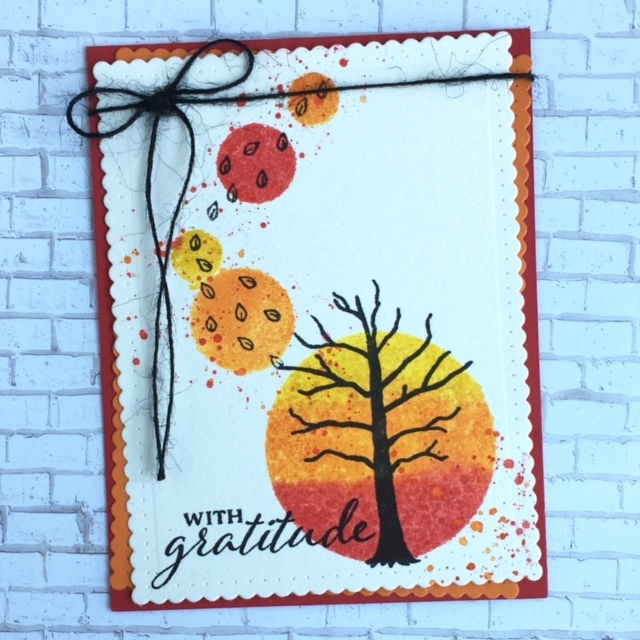 To make this card I used the large, solid circle from A Tree For All Seasons, along with some smaller solid circles from Scenery: Bigger Bang Confetti (the 2015 Black Friday limited edition set). For the large circle I used 3 shades of Distress Ink, Orange Marmalade in the center, Barn Door on the bottom, and Mustard seed at the top. Next I sprayed the inked stamp lightly with water and stamped on watercolor paper. This is something you'll have to play with, too much water and the ink will squish out from the stamp too much, too little water and you won't get as much of a watercolor look. Next I inked, sprayed water, and stamped the smaller circles with the same 3 colors of distress inks I'd used for the large circle. This gave me a wonderful, colorful background that I could stamp some black images onto. I stamped the tree from A Tree For All Seasons on the large circle, and the tiny leaves from Kindness with Evelin T. Designs on the smaller circles. To add the selectively placed splatters that you see on this card I simply placed some pieces of scrap paper on the card where I didn't want the paint to hit, and added the splatters using Barn Door and Orange Marmalade Distress Inks. I stamped the sentiment, also from A Tree For All Seasons, and then trimmed the panel using the larger scallop die from Essentials: Audrey Cutaways. I cut a piece of orange card stock with the scallop die too, and placed both panels, staggered, on a red card base. I finished this card with a piece of black twine tied around the top. This time I used some solid flowers from In Bloom: Eva's Favorite Flowers. The main reason I wanted to show this is so you could see the orange and yellow flower. This is a really pretty effect you can achieve on your solid stamps when you mix 2 or more colors of distress ink and spray them with water! I simply stamped the entire flower with the yellow, and then tapped some orange around the outside of the flower, sprayed with water and stamped and this is how it turned out. Pretty cool, huh? This technique can be used with any of your solid stamps and I hope you'll give it a try! To add color to this next card, I used another very easy technique, and probably my personal favorite technique, ink blending! There's something really magical about ink blending. You can use it to make spectacular backgrounds, or even to color your die cuts, as I did on the above card. I wanted to make a background with a desert feel to it for this card. I used distress inks and my ink blending tool, and the colors I used from top to bottom are Spiced Marmalade, Mustard Seed, Squeezed Lemonade, Antique Linen, Tea Dye, Brushed Corduroy and Gathered Twigs. I know that sounds like a lot of inks but the cool thing about ink blending is that you can combine colors to create a new color, which offers almost limitless color combinations. Some people say they aren't good at ink blending. I find that having a lot of patience, using a light hand, and keep blending blending blending until you achieve the results you like is what works for me. After finishing the ink blending I added some water splatters and ink splatters. I almost always do this with my ink blended pieces because it just looks cool! I stamped the sentiment from Kindness with Evelin T. Designs with black ink, and then I cut out the tag shape using Essentials: Noelle Cutaways and popped it up on foam tape. 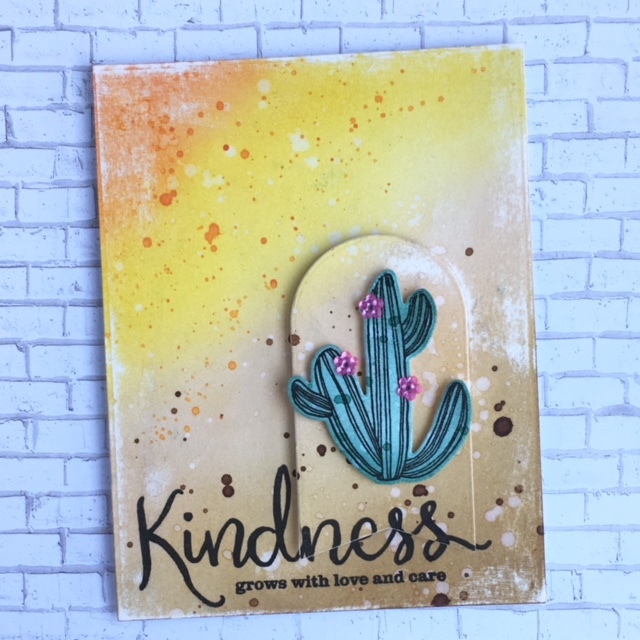 I die cut the cactus using Kindness with Evelin T. Designs Cutaways and used ink blending to color it before stamping the image from Kindness with Evelin T. Designs using black ink. A tip for coloring die cuts like this is to leave them in the card stock you cut them from while coloring, it keeps them in place which makes it easier to color. I colored this cactus first with Evergreen Bough, and then I came back in with some Pine Needles distress ink to add some color variation and depth. To finish this card I used some foam tape to pop up the cactus and added a few cute little flower sequins where the flowers are on the stamp. I also did a bit of distressing of the finish with an emery board (the white lines you see around the edges of the card). I did this because, you guessed it, I had a couple of unwanted black smudges on the card that I couldn't remove so I sanded them off with the emery board :) I had to then sand at other places to even things out, but I love how it looks on this card! You've all been so kind and supportive this month and I truly appreciate that. I've read every one of your comments here on the Winnie & Walter blog and they've made me so happy! If even one of my cards has inspired you to pull out your supplies and create then I consider my performances a great success :) Thank you, Shay, for having me, it's been a blast! Please be sure to visit my blog, It's all about the ART!, and leave a comment for a chance to win a $30.00 gift certificate to Winnie & Walter! I'll be drawing a random winner in a few days from all those who have left comments on my blog for my Leading Lady posts during the month! You cards are awesome Diane! Love the different techniques you used. Bravo!! Congtrats for have been a Leading Lady!!! You really deserved it!! Your cards are amazing, sweet and very sweet!!!!! It has been great to enjoy your nice projects!! :) Hugs!!! Diane these are all so beautiful! I am sorry for your hand condition but you are a perfect example of pushing forward to do what we want. Too often people give up and say "I can't do it!" Why not? If you love it enough, you will FIND a way to "do it!" Thanks so much for your honesty and you wonderful talent, you have made a GREAT Leading Lady! Wow! Quite the collection of fabulous creativity! Love them all especially the one featuring a succulent! Wonderful. I can't begin to tell you how much I have enjoyed your posts, Diane! Each one has been a treasure trove of beauty, inspiration, and helpful tips. Thank you so much for sharing with us. I am intrigued with the techniques you shared today as alternatives to traditional coloring. These all look absolutely fabulous. Once again, I feel like I have been to stamp school and am bursting to try some of your ideas. I'm off to say hello at your blog. Many thanks, again!!! Thanks for sharing these non coloring methods for colorful cards. Amazing tips, Diane, with equally amazing results! Beautiful cards! Love the reverse water coloring esp! All so beautiful. I especially love your last card with the loose watercoloring. Wow, they are absolutely amazing.thanks for sharing your pretty cards here in lading lady. I really love your creation. Diane, your cards this week are amazing and gorgeous! Outstanding, Diane..off to comment at your place! Another post packed with all sorts of beauties! Beautiful cards! 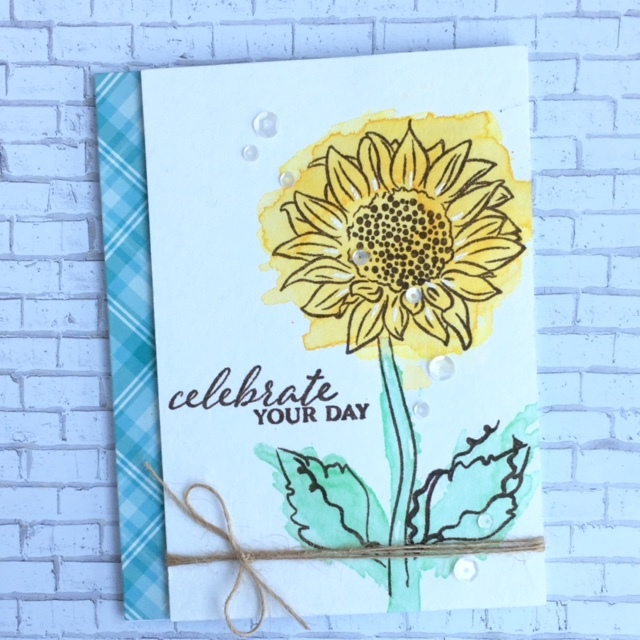 Love the fall tree scene and the pretty watercolored sunflower! Fantastic projects, Diane! Great alternative methods for the ones who have difficulty controlling their coloring, and for other crafters too. 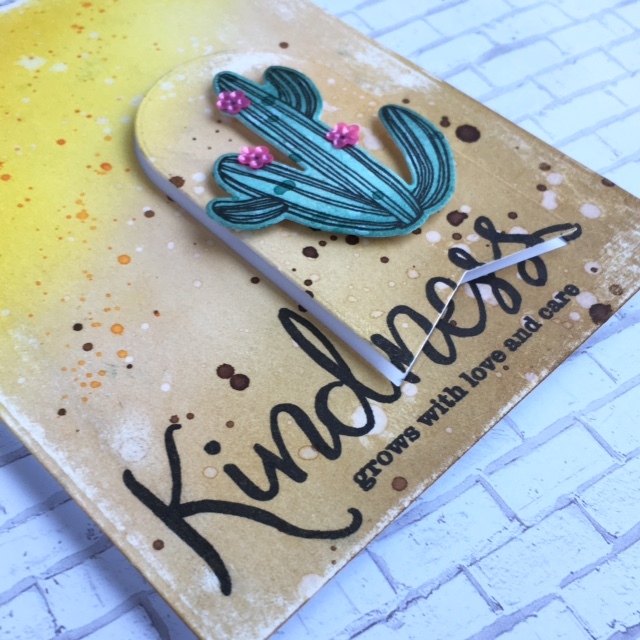 I LOVE the distressed look of your 3rd card... also because I have a huge crush for that cactus :). Thank you for sharing your ideas with us! Wonderful cards once again! Love the sanding tip for smudges! I have never tried that! 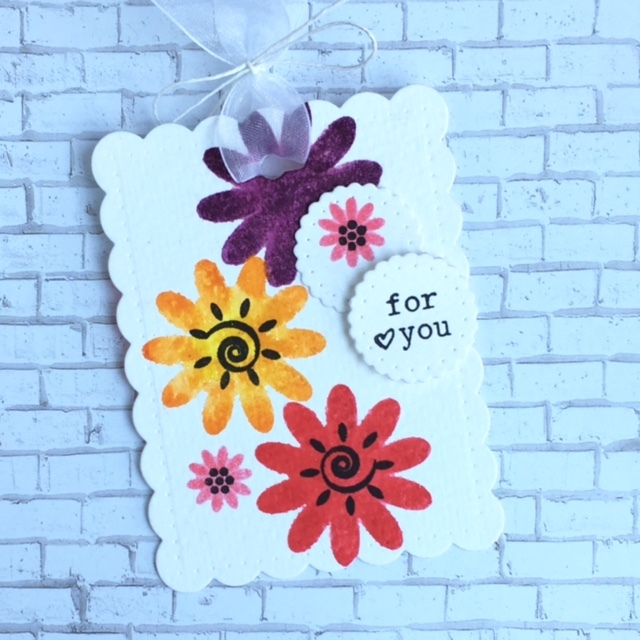 Love how you use distress inks! Very inspiring! Very GORGEOUS!